Help - I'm New! Where to start? Renewable Energy Options: Which Alternative Source of Electricity is Right for You? Will solar work in my location? How much will solar cost for a 2000 square foot home? Should I Wire my Home for AC or DC Loads? Can Solar Electric Panels (PV) be used for Water or Space Heating? 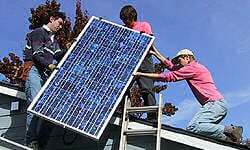 How Many Solar Panels do you need in your Solar Array? What Components do I Need for a Grid-Tie Solar Electric System? What Components do I Need for an Off-Grid Solar Electric System? Can I use all of my normal 120/240 VAC appliances in a PV system?